Seabreeze, the fourth oldest park in America, is located on the scenic bluffs overlooking Lake Ontario north of Rochester. Enjoy the excitement of four roller coasters, a classic wooden carousel, thrill rides, family and kiddie rides, a midway of food and games and live shows daily. There's also a full water park with wave pool, tube slides, body flumes, lazy river, kiddie slides and more. The 1920 Jack Rabbit wooden roller coaster is listed as the oldest continuously operating coaster in America. 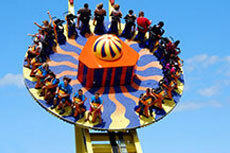 The park is a classic combination of traditional amusement park and modern water park. Open daily mid-June through Labor Day; also open weekends in May, early June and early September.